John Dipper: Projects and ensembles. A performance piece created to celebrate the publication of Alan Garner’s memoir of his wartime childhood in Alderley Edge: Where Shall We Run To? Exploring the power of place, and the author’s ‘one square mile of Cheshire’ the piece combines oral recordings of Alan Garner with folk tales, folk music, playground rhymes and oral archive as the source material. 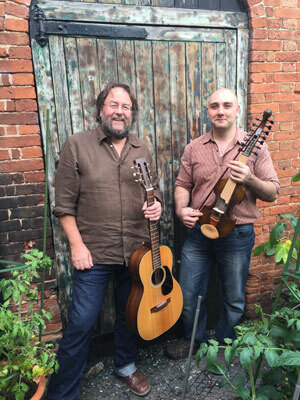 These are interwoven with original compositions by John, played on the 14 string Viola d’Amore, inspired by Alan Garner’s work and by the landscape of Alderley Edge itself. The show is a collaboration between storyteller Nick Hennessey and musician and composer John Dipper - with behind-the-scenes script development support from Alan’s daughter Elizabeth, novelist and editor. With resources and support from the Blackden Trust. Dipper Malkin are a captivating new duo, who are rapidly earning a reputation for elevating traditional music to new heights of sturdy beauty and sophistication. Their debut album 'Tricks of the Trade’ is in the Top Ten Albums of the Year - The Sunday Times. 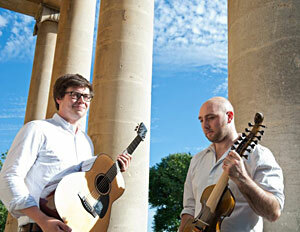 Formed to fuse Emily's passions for Medieval and Renaissance melodies/songs and modern folk styles. Emily has had a successful career in both Folk (Askew Sisters, Alma, Ceilidh Factor and the Elizabethan Session) and Early Music (The Artisans, Shakespeare's Globe, Glyndebourne, The Dufay Collective, Joglaresa, Mediva and the Medieval Babes). Being an multi-instrumentalist playing vielle, shawm, bagpipes, recorders and medieval harp, Emily wanted to explore the possibilities of mixing these unusual sounds with modern instruments. The band bring together singer/guitarist/fiddler Jamie Roberts (Gilmore Roberts, The Dovetail Trio), fiddler/viola d'amore playing John Dipper (English Acoustic Collective, Methera, Dipper Malkin, and Alma) and percussionist Louise Duggan (National Theatre, Regents Park Theatre, Shakespeare's Globe). You are cordially invited to a party at the house of Henry Purcell in the year of our Lord 1686. R.S.V.P. Debut album ‘An Invitation to Dance’ was released in 2017 to rave reviews. 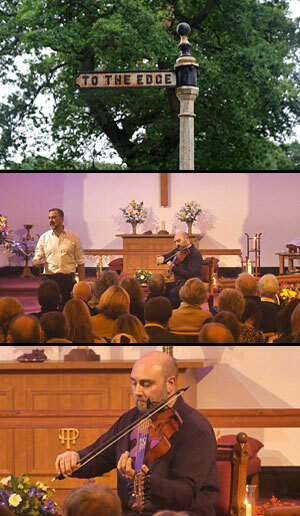 A light hearted programme of music seemlessly blending folk with baroque, Swedish and British and more. Prepare for a humorous fusion featuring the spinet, nyckelharpa, viola d'amore (and a light sprinkling of accordion, gandola and flageolet). 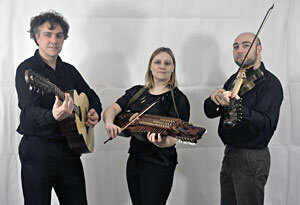 John Dipper (viola d’amore, violin and concertina), James Patterson (guitar and vocal). James has been singing and playing folk music for over 40 years. A long-time collaborator with the late Ralph Jordan (Silas, Crows and Patterson, Jordan, Dipper), he now works in this duo with John Dipper. James and john recently worked with Hugh Lupton and Nick Hennessey on the Barbed Wire for Kisses project, which reveals the first expression of their growing interest in the adaptation of art song to the folk style. James is also a Film Archive Director and Senior Academic at the University of Lincoln. Alma brings together fiddlers John Dipper (English Acoustic Collective, Methera) and Emily Askew (Askew Sisters) with superb guitarist Adrian Lever (Arhai).Debut album ‘Varieties’ released in 2016. “Ethereal and seductive...their repertoire continually springs surprises. The playing is spry, intelligent and joyous too!" Inspired by fiddle traditions from England and across the world, at the heart of Alma's music is the joyful sound of fiddles playing in harmony. Each member of Alma brings their own individual style and influences to the band, which they weave together into a bright and vibrant sound. This includes John’s work with Chris Wood in the English Acoustic Collective and groundbreaking string quartet Methera, Emily’s extensive experience in early music (playing with The Dufay Collective, Shakespeare’s Globe and at Glyndebourne), and Adrian’s knowledge of Eastern European music developed through his highly acclaimed work with Arhai and Horses Brawl. Alma’s unique approach to the gems of each tradition result in beautiful and exciting new arrangements, that tantalise and excite the audience. 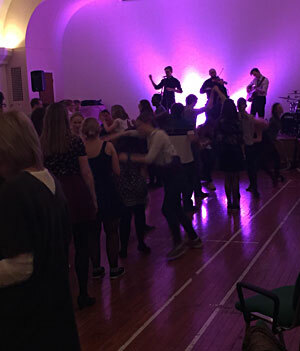 The A3 Ceilidh Band is one of the most exciting dance bands emerging in the UK today. 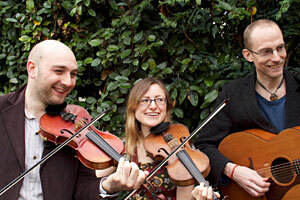 Formed by a small collective of professional folk musicians, their ceilidhs are always fun, energetic & accessible. 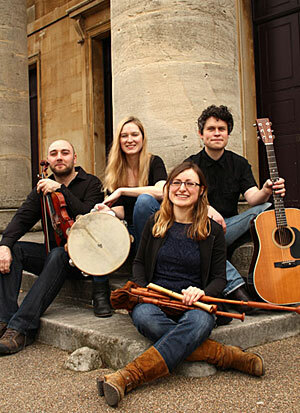 The band plays a range of music from across Britain and Ireland on a dynamic selection of instruments, including fiddles, accordion, flute, melodeon, guitar and drum-kit.